Wait! Honda just came out with The UNI-CUB, an all-electric, self-balancing vehicle much like a small Segway, that utilizes a saddle instead of standing. The UNI-CUB cruises at about three miles an hour, for about 3 miles, and it can fold up for easy storage when not in use. 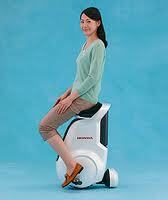 This new personal mobility device is guided by weight shifting and an odd little wheel that protrudes out the back. It was designed to be used to get around the inside of large buildings like airports and museums and it is pretty much based on Honda’s other personal transport device, the U3-X, which was unveiled three years ago. This small, saddle-style transport vehicle makes it easy for any rider to control speed, move in any direction, turn and stop, all by shifting their weight. Because of the enhanced maneuverability and it’s minimal width, riders can quickly and easily make their way around tight corners and zip around objects and other people. So if this small footprint, handsfree transportation method seems like something you could use, please visit Honda.com for more information, to sign up for product updates or to see additional photos and video. Do these things come with a cup holder? iFrogz Boost – Now you all Can Hear It!